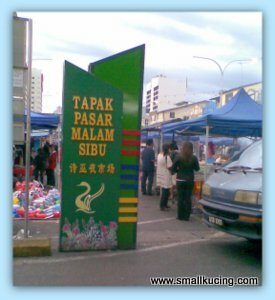 Auntie Claire and Mamarazzi had mentioned many times that they wish to pay a visit to Sibu Pasar Malam(Night Market). But too bad they didn't get the chance to go due to various reason. That evening as we were heading back to the hotel, Papa passed by the Pasar Malam. Stalls were just opening. That was around 6pm. Papa asked Mamarazzi whether she wanna go and have a walk. Of course la she jump and grabbed the offer. Me too wanna follow. Papa wait in the car. Wow......even have signboard stating it's the Night Market place. Hmmm....things sold there seems pretty normal to Mamarazzi. More or less the same like those Night Markets in KL. Pretty normal ...that is until she saw 3 stalls selling these at the Night Market. Sorry for the blur photos as it was taken using Mamarazzi's handphone camera. 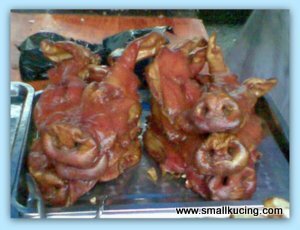 For your information, these are Roasted Pig Heads. 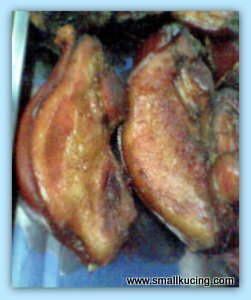 It is very unusual find Roasted Pig Head being sold in Night Markets. So far she haven't seen any of it being sold in KL Night Markets. One Roasted Pig Head cost around RM16 to RM20. They also sell half portion. Mamarazzi bought half. 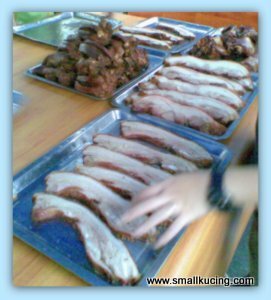 Then she saw these delicious Grilled Pork Belly Meat. Can't helped herself. Bought one piece for RM12. That was very cheap in view that piece was quite big. Gosh! There were some pretty delicious looking Roast Pork. See! People are just grabbing for these delicious Roast Pork! And some stewed internal organs of pigs. Too bad she can't try it all. 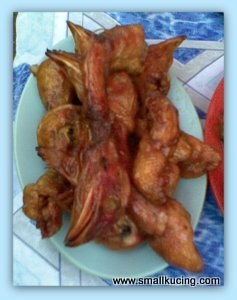 But one thing she certainly would not like to try is these...Fried Chicken Head. Apart from that she managed to grab two pieces of Batik Cloth which is cheaper than those being sold at the Heritage Centre. These cost around RM15 a piece only. Certainly the price can go lower if she had the time to bargain. Yup...it was time to go to the airport. We had a nice time in Sibu. Thank you very much Uncle Arthur for everything and hope to see everyone(Auntie Claire, Auntie Quay Po Cooks, Uncle Arthur and Mommy Ling) again soon. Where shall we go next?. Welcome! Come again soon... So boring, so lonely here without everybody around. Sobsssss!!!!! wah, this is really a very different pasar malam lah..
second, they have so many kinds of HEADS on sale?? wow, amazing!!! those heads definitely looks awful to me.. so scary!! got people eat one meh?? wah, mamarazzi somemore bought half pig head!! errr, nice one ah?? got things to eat meh?? maybe 100 years ago, they have human head from the headhunters~~ @_@"
Next destination..probably Medan...? Are you coming....? 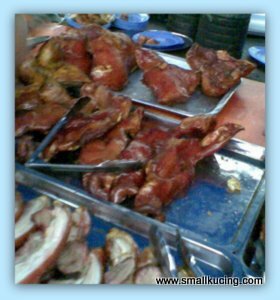 I will be back to Medan in nov.
omg..roasted pig heads at pasar malam! Yeah...Arthur has included PM as one of our itinerary. 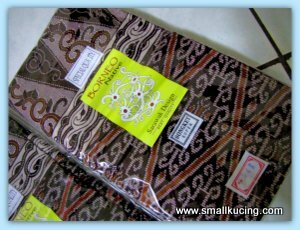 hopefully the malays didn't see those..
See you bought a lot of batik cloth, can I know what you want to do with the batik cloth? As I don't wear sarong at all, not sure what other usage it can be used for. 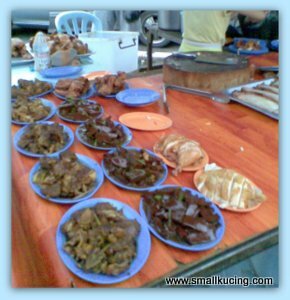 The meat looks really delicious, and i don't see any reason for the warning..
Tell them, smallkucing - here...Malay stalls side by side with all the other stalls, facing one another also got. 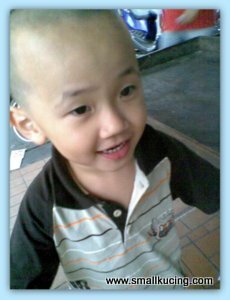 Here, not the same lah!!! 1Malaysia, true and true...very harmonious. 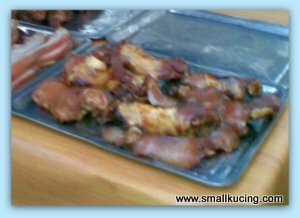 The pig head didn't shocked me but the much more smaller size chicken head did =.="
Wah so many pig heads! 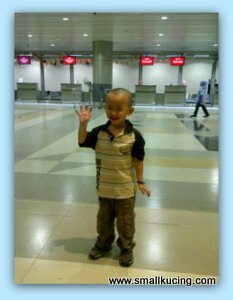 Haha would love to visit Sibu one day too! Looks like the people in Sibu enjoy eating heads and I do also but more of the fish head. I am drooling over the lovely spread of the roasted googies, esp the pork being one of my fav. memang different lo the pasar malam there. Here mana ada signboard one. A lot of oink oink head and body parts. AHything you what, you can find there. And most important is that you can see those from other religion also there selling next to the 3 stalls. 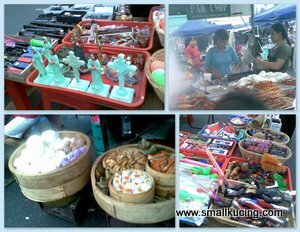 the stalls are next to malay, indians and the natives. Too bad this is not like FB ...else i can click "LIKE" your comment. Well said!